The battle for straight line supremacy has been intensifying beyond measure lately. The closely fought battle for top speed bragging rights has been like a triple threat match between Hennessey, Bugatti and Koenigsegg with the Swedish hypercar manufacturer having recently snatched the crown for the fastest production car from the Bugatti Veyron Super Sport with its Agera RS. 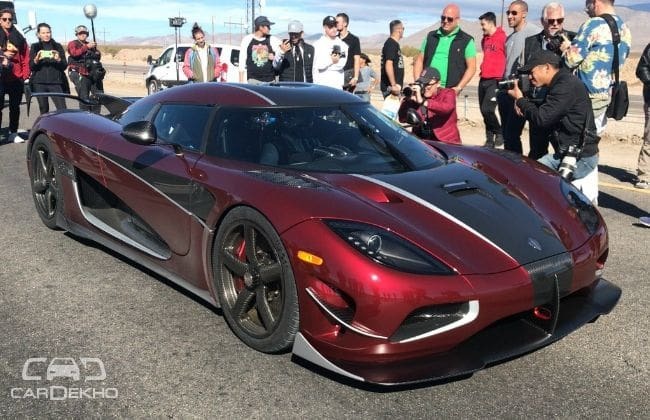 Koenigsegg’s Agera RS achieved a two-way average speed of 277.9mph (447kph) on Nevada’s Route 160 while clocking an unbelievably fast 284.7mph (458kph) on one occasion! The Swedish automaker had shut down the 11-mile stretch to attempt the fastest production vehicle record with several natural obstructions like wind and G-forces to deal with. The hyper performance machine was driven by Koenigsegg’s factory driver Niklas Lilja. He managed to beat the earlier record of 265.7mph (427kph) set by the Veyron Super Sport seven years ago. The engine that propelled Koenigsegg to the top is a 5.0-litre, turbocharged V8 which puts out almost 1400PS of max power and 1370NM of peak torque. Koenigsegg had earlier used the same car for a 0-400-0 run that it completed in a mere 36.44 seconds! Koenigsegg used Michelin Pilot Sport Cup 2 tyres for the deed. These tyres can also be found on the Bugatti Chiron and the upcoming Hennessey Venom F5, which the US-based company claims is capable of 301mph. The Swedes might have pulled a victory for now but the title is hardly going to stay with them keeping in mind the kind of developments happening among their rivals.